Figure 1. Changes in ocean surface temperatures are used to identify El Nino and La Nina trends for the coming months. ENSO readings of ocean surface temperatures indicate a weak El Nina developing in late summer 2016. During the past 30 days an aggressive precipitation pattern has taken shape across Nebraska and most of the High Plains region from North Dakota south through Texas. Although a strong El Nino event is currently reaching its peak and is projected to weaken through spring, precipitation patterns across the United States have not conformed to typical El Nino signals. The latest Climate Prediction Center Update indicates that the consensus of atmospheric models (Figure 1, yellow curve) points to weak La Nina conditions developing in late summer. A typical El Nino pattern — as defined by events from 1950 to the present — would result in a split flow pattern across North America, with the Subtropical Jet (Southern Jet) having a mean position across the southern third of the United States. The Northern Jet is usually weaker and displaced well north of its mean winter position. This usually creates a split flow pattern leaving most of the central United States well north and south of the primary storm tracks during the heart of winter. The most common precipitation patterns during an El Nino event are cool wet conditions across the southern third of the U.S., dry conditions in the eastern Corn Belt and Pacific Northwest, and warmer than normal conditions across the northern Plains and western Great Lakes. These conditions occur 70%-90% of the time. During the past two months, exceptional rainfall has hit the Pacific Northwest, while the southwestern US has remained drier than normal. The central Midwest (Nebraska to Illinois) has turned aggressively wet, while the southern Plains is confirming a wet El Nino signal (Figure 2). This is a gentle reminder from Mother Nature that every El Nino event has its quirks and that other atmospheric weather patterns can work with the El Nino signal to create counter trends. The storm system that slowly moved through the region Dec. 12-14 dropped 2-4 inches of moisture across southeast and east central Nebraska, with most of Iowa receiving 3-5 inches. This same system brought 6 -15 inches of moisture to the Pacific Northwest and northern California before moving toward the southern Plains. 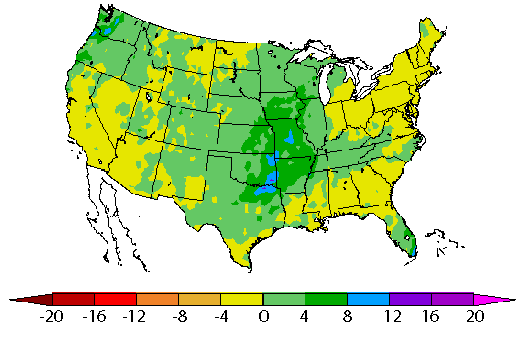 With no frost in the ground, recent storms have significantly added to soil moisture. Most of the dryland corn region of Nebraska has received 4-6 inches of moisture since October 1, which we typically define as the beginning of our soil moisture recharge period (Figure 3). 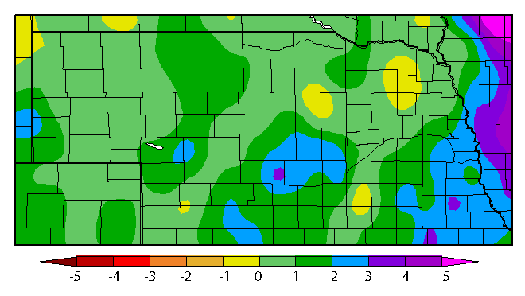 Extreme southeast Nebraska has received 6-8 inches of moisture. 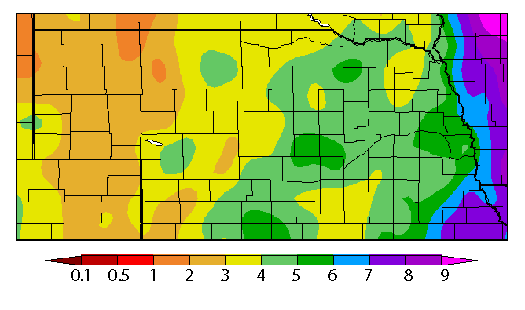 Surplus moisture for the period now ranges from just under 1 inch to four inches above normal for pockets of central and southeast Nebraska (Figure 4). There are a lot of soggy fields and feedlots with our recent wet trend. Unfortunately the current forecast continues to indicate wetter than normal conditions for the southern Plains extending northward into the southern third of Nebraska. With little frost expected this winter as the El Nino event unwinds and above normal temperatures are projected to continue, excessive moisture and muddy conditions may be problematic for feedlots. 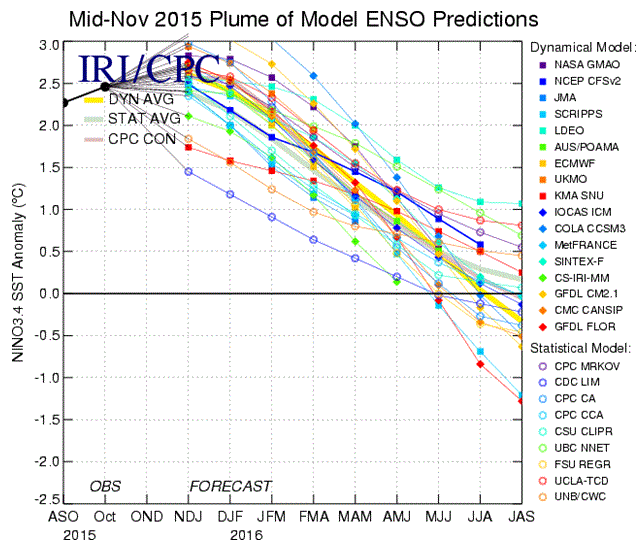 When I issued my winter forecast last month, my expectations were based on the typical response from a strong El Nino. I favored an aggressive start and end to winter, with benign conditions January through mid-February as a result of a split flow pattern. So far this has not developed, although models continue to indicate further southward movement of each successive storm system entering the west coast over the next two-and-one-half weeks. If a split flow pattern fails to materialize during January, then it is likely that the aggressive storms moving into the west coast will continue to lift northeastward toward the central United States during the remainder of the winter. This would lead to further heavy precipitation events containing wet snow, ice, and rain. If the typical wet and cold pattern experienced 60-75% of the time during the Mar-May period for Kansas and Nebraska develops, a significant flood risk will exist for all low lying areas across the southern two-thirds of the state as we approach the spring planting season.